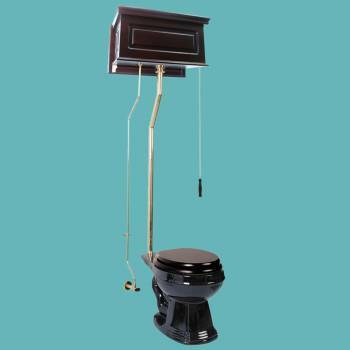 High Tank Toilets L-pipe: Renovator's Supply's stylish high tank round toilet will lend your lavatory the charm & ambiance of the Victorian age. We've updated the materials and components with 21st century technology. All tanks are a water-saving 1.6 gallons per flush. Ready to install with all mounting parts, includes dark oak finish raised panel tank, liner, supply line, angle stop, mounting hardware and grade A vitreous round bowl. Toilet seat not included. Adjustable overall height 70 in. to 74 in. & adjustable rough-in 12 to 15 in. Wooden Toilet Seat Not Included, Sold Separately.